1. Golf: Well what else would be number one? Blue Canyon Country Club Canyon Course (18): expensive, nevertheless a famous must play. Loch Palm Golf Club Old Course (18) and New Course (9): new course maybe the best in Phuket as of February 2007, one of only 3 courses with golf buggies. Blue canyon Country club Lakes Course (18): now even better after the 2006 renovations. Phuket Country Club Old Course (18) and Country Club Course (9): both courses are great, probably most under-rated of all Phuket courses. Thai Muang Golf and Marina (18): takes 1.5 hours to reach but worth it, spectacular golf adjacent to the Andaman Sea. Laguna Phuket Golf Club (18): balanced resort course with mostly average golf. Mission Hills Phuket Golf Resort (18): fairways unplayable, avoid for a while. 2. Excursions: On days off from golfing in Phuket, or for non-golfers wanting a change from the pool or the beach, there is a wide range of activities on offer. These activities include: big game fishing, the "June Bahtra" junk cruises, cave canoing, elephant trekking, white water rafting, jungle safaris, national parks and waterfalls, temples (especially Wat Chalong), museums, aquarium, orchid garden and Thai village, cashew nut factory, pearl farm, Thai cooking and dancing lessons, spas and massage, and a cobra show at the snake farm. 3. Island Hopping: Speedboat and island trips are available to Phi Phi Island, Krabi, Koh Kai , and Koh Nok and Koh Nui (my 2 favorites) with snorkeling and scuba diving available. Some tours specialize in sea village visits, others in cultural sites, and still others around shopping and handicrafts. 4. Romantic Sunset: Viewing the sunset from the hilltop vantage point on Laem (Cape) Promthep, Phuket’s southernmost point, with fabulous views over the ocean is one of my favorite things to do while visiting Phuket, and it is free. 5. Dinner Shows: Phuket FantaSea is the most spectacular show, suitable for the whole family to see. It is a little “touristy” but worth it if it is your first time in Phuket. Also enjoyable is the Simon Cabaret. More low-key is the Sphinx Restaurant & Theatre on Rat-U-Thit Rd in Patong, with twice-nightly dance shows and rendition of Broadway hits and other classics in its well-appointed upstairs theater, for only 300 Baht per show. 6. Shopping: Phuket Town with its funky shops has a good variety of outlets where you can pick up unusual inexpensive gifts to take home. The Central-Big C shopping complexes and surrounding areas are worth a visit for inexpensive items. Near to the Heroines’ Monument is the cash and carry where the locals shop for cheap food, liquor, tobacco and other consumables.. 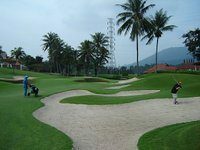 Arrangements for all of these activities can be made on the spot, or a specialized Thailand golf travel agent can prearrange a complete program for golf and leisure insuring you enjoy all Phuket has to offer. If anyone has any good Phuket suggestions please post a comment here or drop me an email at my Thailand golf vacation company and I will take care of the posting duties. Rent Or Bring Your Own Golf Clubs To Thailand?